1. Source: KXAN News. Survey submitted by: MSRCMS. A Texas (USA) rancher found a unique way to test out Petco's "all leashed pets are welcome" policy. 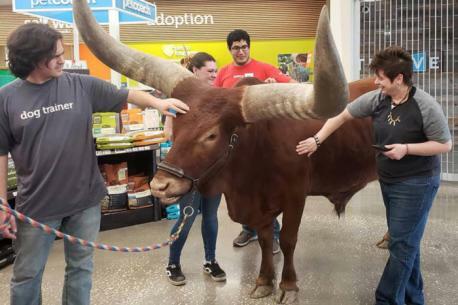 He took his African Watusi steer, Oliver, into the store. Are you familiar with this story? 2. Vincent Browning's goal was to see if the company stands by its claim. 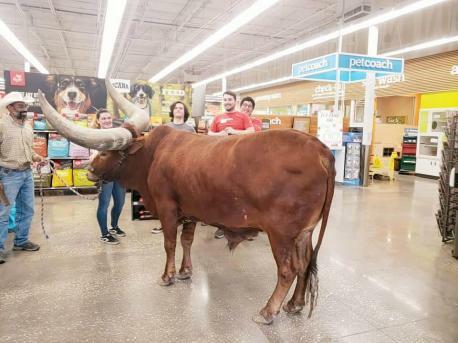 The pair walked into the store, and Oliver was greeted by employees without a problem. Have you ever taken your pet (cat, dog, rabbit, ect.) into Petco? 3. Browning said on Facebook that the Atascocita Petco was his and Oliver's favorite by far. African Watusi steer are typically between 1,000 and 1,600 pounds. Their demeanor is generally described as docile. If you are a pet owner, would you try taking a larger animal (steer, horse, ect.) into Petco to test their leash policy?